I can’t believe I’ve finished this series. It took me so long to get round to finishing, but it’s all I’ve been thinking of for the past couple of weeks. Take a read of the quote I included in this, because it’s exactly how I felt about this series! 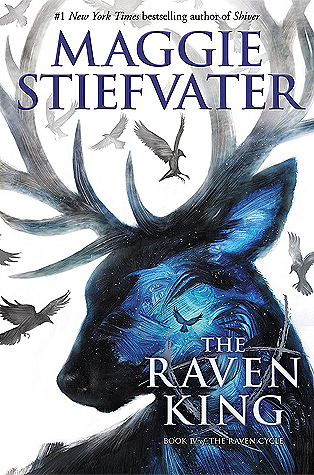 The Raven King was ups and downs for me, but I did end up loving it. Something I disliked..where was Noah? The little sweet thing, I missed him so much in this book. His lack of presence was the only thing I really disliked, and it made me feel Henry was only there to attempt to make up for it. Sorry, Stiefvater, but a Noah shaped hole can never be filled. I do have to say that I unfortunately found the pacing off yet again in this book! But once I got into it, it flew past for me. I found the plot interesting, and I’m glad this one focused mostly on the group of friends rather than villains, and included some really interesting scenes with them all. Talking of the group of friends, I won’t give spoilers but I ship two different couples in this book 😉 Fans of the series will know how happy I feel! I mentioned in my review for Blue Lily, Lily Blue that I felt each of these books focused more on a different character, but I’m happy to say that I think The Raven King made the group equal. I loved reading about each of them! I don’t think I can say enough about the characters. It’s just so rare for YA to not focus on romance and actually focus on intimate friendships and friendship groups instead. Alongside Stiefvater’s absolutely beautiful writing and scenes that will stay with me for a long time to come, I feel the characters and their friendship warms my heart the most. That’s what made me truly fall in love with this series. i just (finally) ordered The Raven King! can’t wait to get my hands on it 🙂 glad you loved it/great review! Yay I’m so excited to read your review for it!